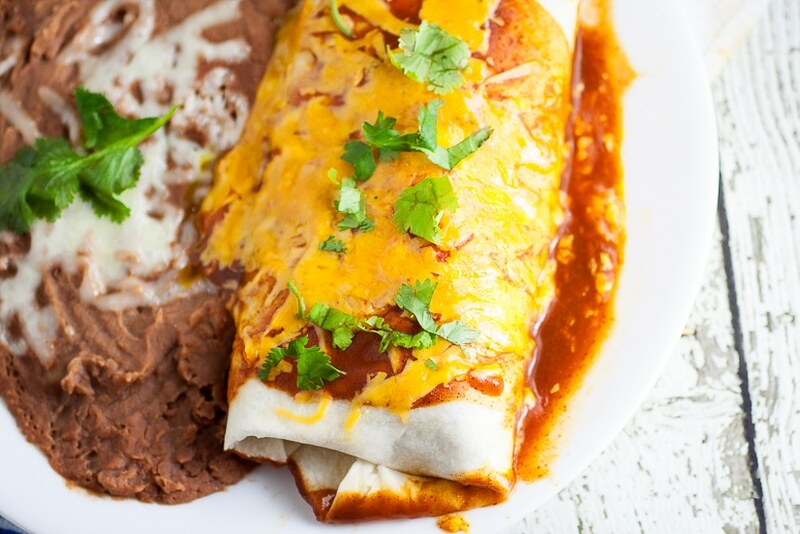 Quick and easy Mexican-inspired dinner, these Rice and Black Bean Burritos are filled with flavorful rice and beans and smothered in enchilada sauce and cheese for a yummy vegetarian dinner perfect for Meatless Monday. I’ve been trying to eat vegetarian more often lately. Mostly because it’s a really easy way to cut grocery costs, which is almost always the goal when you’re feeding a family five. Black beans are one of my favorite vegetarian ingredients to work with because they’re easy to incorporate in pretty much everything. Of course, I like to go the Mexican-inspired route quite often, like with these Rice and Black Bean Burritos. They’re quick and easy to make, and I like to give them a quick bake in the oven with some sauce and cheese so that they’re “wet” burritos. So good. To make your own Rice and Black Bean Burritos, you’ll start with the filling. Heat a couple of splashes of olive oil in a large skillet (I like cast iron best, like this one). Once the oil is hot, you can add your rice and onions and cook for just a couple minutes until the onions are tender. This quick process will also keep your rice from becoming too mushy, too. 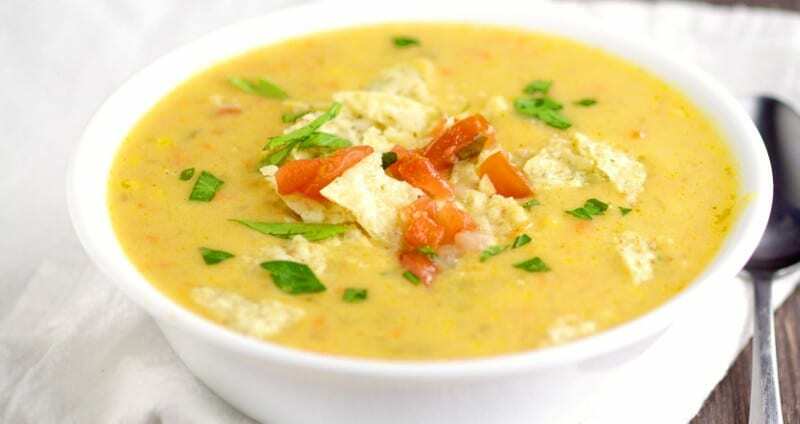 Stir in your tomatoes and green chiles, water, chili powder, and cumin, and bring the whole mixture to a boil. When it starts boiling, reduce the heat to about medium and continue cooking for about 15-18 more minutes until the rice is tender. When rice is cooked through, remove it from the heat, and add your beans, corn, 1 cup shredded cheese, and cilantro if you’re using it. We usually use cheddar, but you can pick your favorite. Stir everything together to combine. Scoop the rice and bean mixture into the tortillas, and roll up like a burrito. If you don’t know how to do that here’s a quick tutorial. Just fold two opposite sides of the tortilla in over the filling. Wrap one of the unfolded sides up over the filling, and then roll it up. 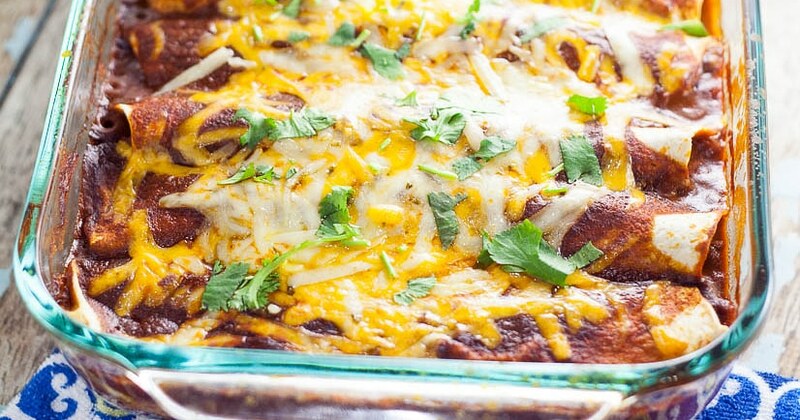 Place the burritos in a lightly greased baking dish large enough to fit them. I ended up using two 9″x 13″ to fit enough burritos for all of us. 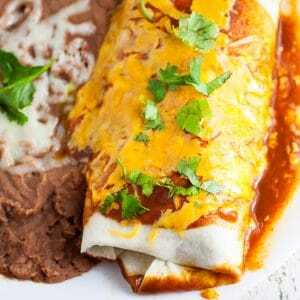 Pour the enchilada sauce on top of the burritos and sprinkle the remaining cheese. Bake in a 350° oven for about 15 minutes until the burritos are heated through and cheese is melted. 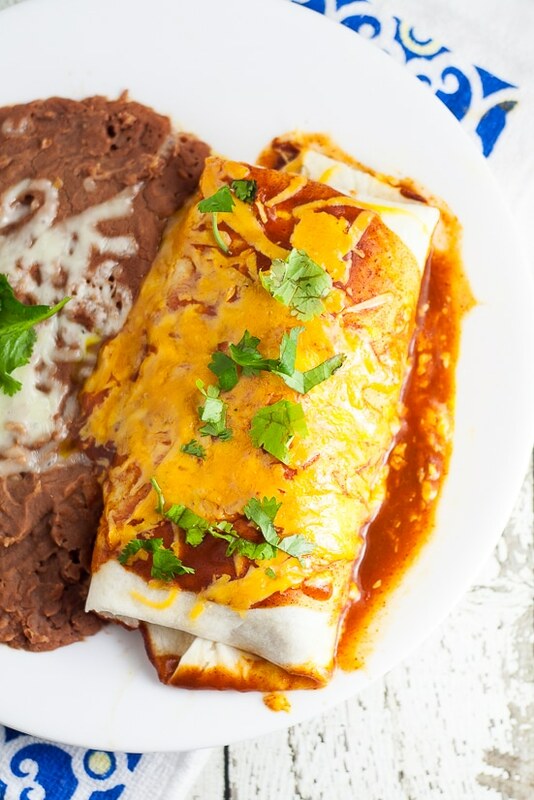 Serve warm with sour cream and guacamole and any of your other favorite burritos toppings! Stir in tomatoes and green chiles, water, chili powder, and cumin. Bring mixture to a boil. Then reduce heat, cover, and simmer until rice is tender, about 15-18 minutes. When rice is tender, uncover. Add beans, corn, and 1 cup of shredded cheddar to the rice mixture (Add cilantro now, too, if you're using). Stir to combine. Scoop rice mixture into tortillas. Fold over 2 opposite sides of the tortilla, then roll into a burrito. 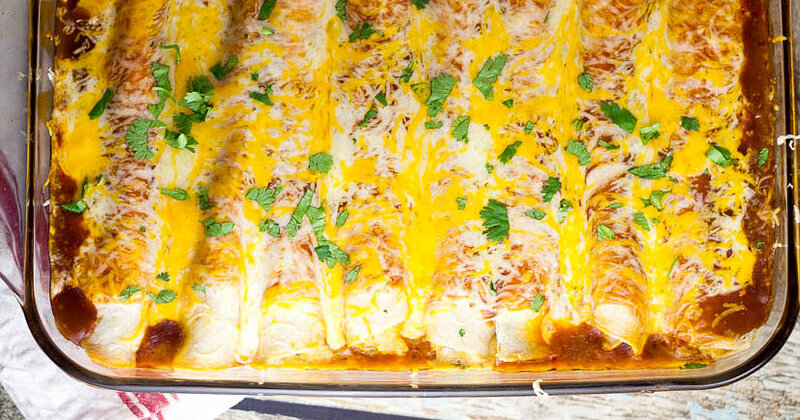 Place rolled burritos in a lightly greased 9"x13" baking dish. 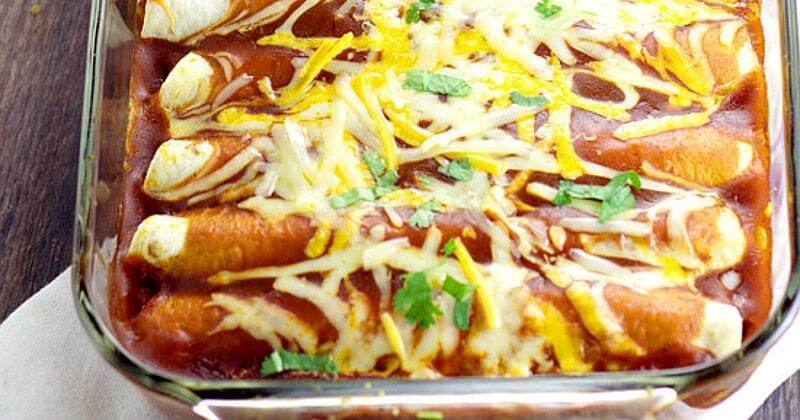 Pour enchilada sauce on top of the burritos. Sprinkle remaining cheese on top. Bake at 350° for about 15 minutes, until cheese is melted and burritos are heated through. 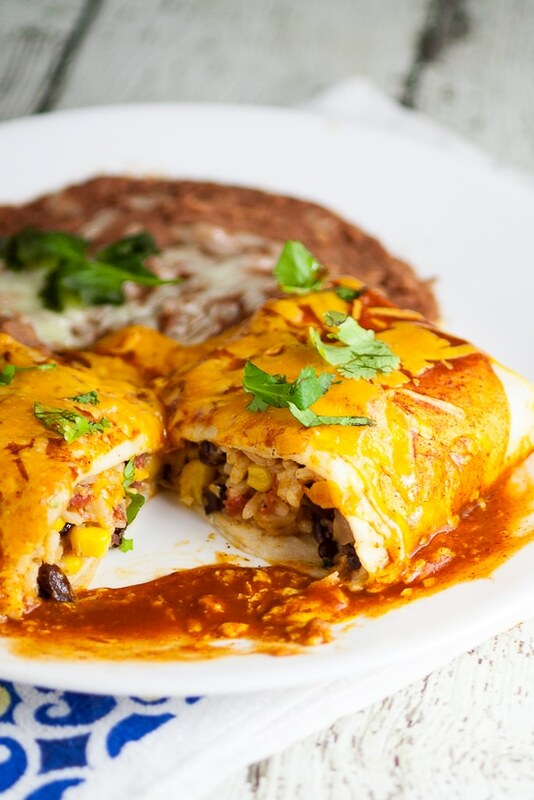 Did you like this Rice and Black Bean Burritos recipe? Find more on my Dinner Ideas and Salads & Side Dishes boards on Pinterest!